For background information on the spying scandal see The Age’s report published on 7 January 2012. Links to further commentary are at the bottom of this post. This post was originally published on Brian Walters’ blog. NOTE: There will be a protest action outside Martin Ferguson’s office (159 High St, Preston) on Thursday 12 January, 4.30pm onwards. 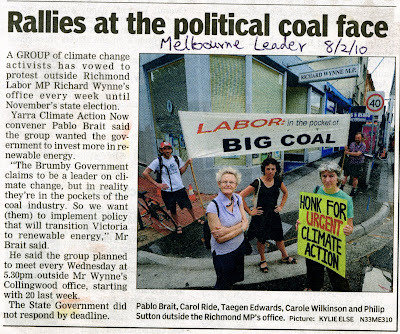 Today the Age reported that the Federal government has been spying on Green groups, particularly environmental activists peacefully protesting at coal-fired power stations and coal export facilities. Martin Ferguson, the member for Batman and Minister for Resources and Energy, requested the additional surveillance, prompted by lobbying by the coal energy companies. These companies are largely foreign-owned. Over the next five years, foreign-owned mining companies will ship some $50 billion per annum offshore in dividends. Not content with their campaign against a tax on their super profits, these vast corporations are now using their influence to have Australian authorities covertly spy on their political opponents – and they have a ready supporter in Martin Ferguson. This surveillance of community groups is one-sided: it is not directed at companies who break the law. There is no surveillance of board rooms to find out what other plans they might have to use their resources to alter the political debate in Australia. Nor is it being used to detect breaches of environmental laws by these companies. It is directed against the very community which should be sovereign in a democratic system. You won’t be able to find out if your group or your emails have been spied on. This would be exempted from disclosure under s 37 of the Commonwealth Freedom of Information Act. This means that the community will not be able to challenge the use of these covert powers in any specific instance. The latest news follows revelations in 2008 that police have been infiltrating community groups and spying on them. Today we need the voice of the community like never before: the corporations trying to protect their position are jeopardising the future of humanity – and the Earth itself – with their dig it up and burn it approach, and the community is our last best hope. The chill effect on community participation where government agencies are spying on participants is well known and makes it so much harder to act against the big carbon economy. Democratic power requires community participation: it is the very essence of the idea of democracy that all can have a say, that all can seek to lobby, that all can seek to change laws and indeed their representatives. 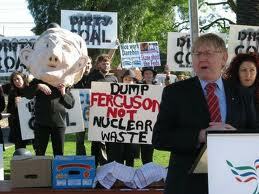 For Martin Ferguson to be siding with big coal against the future of the planet is not surprising. It is consistent with his dreadful anti-environment record, including recently promoting the sale of uranium to India. And of course he’s no stranger to protesters – because they have taken their campaigns right up to him. Now he’s been caught urging the use of covert government power to spy on those who have challenged him – and who have challenged the companies whose interests he has championed. Spying on community groups is a hallmark of totalitarian regimes. It is an unaccountable use of power which undermines the foundation of democracy itself. Australia should not stand for it. For further commentary see the Northcote Independent blog. On the eve of the Federal Government decision that could make or break HRL, the proposed new coal-fired power station for Victoria, it’s up to us to convince the politicians that in 2012, new coal-fired power stations are a dud investment. In 2007, the Howard Government awarded HRL a grant of $100 million. But 5 years later, HRL have failed to meet the conditions of the grant and no money has changed hands – yet. Now this funding is under review. Say NO to funding this polluting new coal-fired power station, and YES to clean renewable energy. Speakers include Mr. Kelvin Thomson, ALP Member for Wills and Mr. Adam Bandt, Greens Member for Melbourne. With you at the rally, MPs from across party lines supporting us, and over 12,000 of your hand written signatures on our petition, we can show the federal and state governments that HRL is a dud investment. Together we can convince the Gillard Government to withdraw their $100 million, and put it into renewable energy instead. But we need you to join us! Please, make sure you’re with us on the 1st February. Stand up for renewable energy! “Energy Minister” Martin Ferguson is the fossil fuel industry’s man in the Labor Party. He stands up for coal, oil, gas and Uranium interests, while doing his best to slow the roll-out of clean and cheap renewable energy technologies. He’s not an energy minister, he’s the minister for maximising fossil fuel company profits. He’s not an energy minister, he’s the minister for maintaining the dirty and unsustainable status quo. Come and join us early on the morning of Tuesday 13 December to help us form a welcoming party for Minister Ferguson before he addresses the Committee for Economic Development of Australia. Organised by Martin Ferguson’s constituents in Darebin Climate Action Now and Yarra Climate Action Now. During May LIVE (Locals into Victoria’s Environment) is hosting a grandparent-led, month long vigil on the steps of the Victorian Parliament House. They’ll be there, from 11 am to 3 pm, every day in May, including weekends. Each day there will be a speaker at 1 pm. Pablo Brait, YCAN convenor will be speaking there on Tuesday 10 May. I became a grandparent for the first time on 1 April 2011. I fell in love the instant I finally saw a little bright eyed round face staring up at me from inside a firmly swaddled bundle of blankets. Little Sammy’s impending arrival had made me think all the more about the critical need to do something about climate change. Meeting him and holding his precious little hands have made the future very real, very close and very scary. Here is a little person just come into the world who will be nine in 2020, 19 in 2030 and 29 in 2040. I will be 80 by then and still going strong! But what will the state of the climate be? I have to believe that we as a species will have done something extraordinary and amazingly fixed up the incredible mess we’ve made. Sitting on the steps of Parliament House doesn’t feel like doing enough, but I am privileged to have the time, some unexpected income and sitting is not all that hard to do! I treasure the privilege of living in a democracy and want to utilize every democratic opportunity possible. I ran as a candidate for the Greens in 2008 and 2010 and have been an active member of local environment groups in the Merimbula and Upway areas as well as a parent advocate in many education settings. Small groups and ordinary citizens can and do change the world. This action is a humble attempt on my part, for Sammy, and all the children around the world. So get down to Parliament House, on Spring Street in Melbourne to join LIVE on the deckchairs, to hear some of the fantastic speakers and lend your support to this inspiring action. Check out the website for a whole range of things you can do and videos of the participants. Did you know that the company HRL is planning to build a new coal-fired power station in Victoria? The proposed new 600MW HRL ‘Dual Gas’ power station is likely to received works approval from the Environmental Protection Authority (EPA) sometime in the next few weeks. Despite relying on a mixture of synthetic gas (produced from coal) and natural gas, it nevertheless is still as dirty as a black coal-fired power station. Public money is being used to fund this project, with the primary financiers currently being the federal government ($100m) and the state government ($50m). Go to the Stop HRL website for more information and to sign up to action alerts. Environment Victoria shows the way. Are You In? from Environment Victoria on Vimeo. Environment Victoria are moving to a position of political activism in this year of climatically critical State and Federal elections. This solid responsible environmental NGO known for its careful policy recommendations is pushing to mobilize all Victorians – 5 million people to become actively involved in safeguarding our environment. It’s about each one of us taking actions to help the environment in our own special way. Actions that are meaningful to us as individuals—and remarkably powerful when they are multiplied by 5 million. A number of campaigns are specified on the Environment Victoria website any or all of which deserve the endorsement of YCAN’s supporters. YCAN endorses and is directly involved with other climate change and environment groups in the Replace Hazelwood campaign. It’s now or never. We either do what we can now to promote the necessary changes to stabilize and reduce greenhouse gas emissions or become complicit in the extreme degradation-of, perhaps the destruction of our collective future. Go to the EV website, sign up as a backer and get as many of your friends and family as possible to do the same. YCAN’s re-branding sessions outside the office of Richard Wynne, Labor member for Richmond are catching people’s attention. See coverage below from the Melbourne Leader and Melbourne Times. 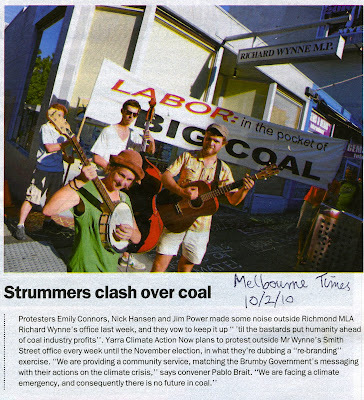 Please get in touch to help with the campaign to get Victoria out of coal and into renewable energy: yarracan -at- gmail.com, or drop in to a re-branding session for a chat, every Wednesday, 5.30-6.30pm, 112 Smith St, Collingwood.